The Regent’s Canal was built between 1812 and 1820 to link the Grand Junction Canal’s arm at Paddington Basin to a new basin at City Road and to the Thames and docks at Limehouse. With the arrival of the Regent’s Canal at Hampstead Road in 1816, Camden became an interchange centre for transfer between canal and road. This traffic grew much faster when the Canal was opened to Limehouse Dock in 1820. The first lock constructed at Hampstead Road in 1816 was a two stage single lock with a highly innovative hydro-pneumatic mechanism patented by William Congreve, an inventor of repute. This was designed to save the water normally used in lock operation, as there were serious problems over water supply. Caissons weighing over 26 tons each, cushioned on air, were raised and lowered by moving air between caisson chambers. After a short period of operation with lengthy downtime for repairs, the system was abandoned in favour of a conventional double lock with a single lift of 6 ft 8 in (2.0 m), dating from 1820, as is seen today. The water supply problem was resolved by pumping from the Thames at Chelsea and trading supplies with the Grand Junction Canal Company. The first basin on the Regent’s Canal was built above Hampstead Road Lock by James Morgan, the engineer for the Regent's Canal Company. Traders established wharves upstream of Hampstead Road Lock early on, because it lay at the London end of a long reach of canal that extended for many miles westwards through Middlesex without interruption by locks. It was moreover the temporary terminus of the Regent’s Canal from 1816 until its completion eastwards in 1820. They made docks here, to extend the length of space where boats could tie up for loading and unloading their cargoes, three on each side of the canal. Two of these docks can still be seen today: the Interchange Basin and Purfleet Wharf, latterly Dingwall’s Dock, both on the north side. Before the railway arrived, the Regent’s Canal was already busy with diverse traffic, carried on a variety of vessels – ordinary barges (up to 14 ft wide) that plied the broad canals and rivers of the London area; lighters that delivered and received cargoes directly alongside ships moored in the Thames or in the Docks; sailing barges that could navigate the open tidal waters and creeks downstream of London yet were sufficiently small to pass the Canal’s locks; and narrowboats, half as wide as ordinary barges, that were sized for the smaller gauge canals of the Midlands. The narrowboats carried the long-distance traffic to and from places like Birmingham and Manchester, traffic that was about to decline significantly in the face of railway competition. The canal company opposed a railway goods terminus at Battle Bridge and the transport of goods on the Euston extension, and introduced a number of other protective clauses in the Acts. But there was also cooperation where this was in the interest of the canal company, with many of the materials needed for building the railway and goods yard being delivered to Camden by canal. Reduced tolls and concessions to unload onto the canal’s banks were agreed for the contractors William and Lewis Cubitt. The Bourne print below shows the delivery of construction material to Cubitt’s site where the stationary winding engine house was being built. 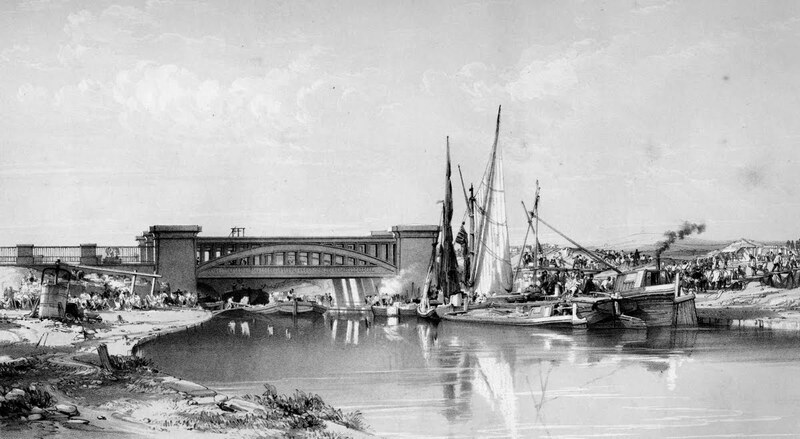 The picture was drawn from close to the present location of the Pirate’s Castle, and looks west towards the railway bridge carrying the main line over the canal at the top of Camden Incline. The bridge was a bowstring arch with the deck suspended from the arch ribs to give the required 10 ft (3.0 m) clearance. The canal company also agreed to supply water to the L&BR’s locomotives at the Camden Station. This arrangement proved to be more than temporary when the L&BR, and subsequently the LNWR, sank wells at Camden only to discover that, while suitable for public supply, they were unsuitable for locomotives because of the concentration of sodium carbonate. From the start of operations, the canal delivered coal to the towpath on the north bank of the canal, east of the railway bridge, for the supply of the stationary winding engine boilers, the location shown in the picture. Here there was a recessed area where coal could be landed and a tunnel that led to the vaults, almost certainly furnished with light rails to carry bottom opening wagons to the coal vaults. The canal company charged 4d/ton for the delivery of coking coal to the canal bank at the coke ovens, a charge the L&BR were keen to avoid, especially as they were also meeting with obstruction from John Semple who held the leasehold title to the nearest dock and wharves. 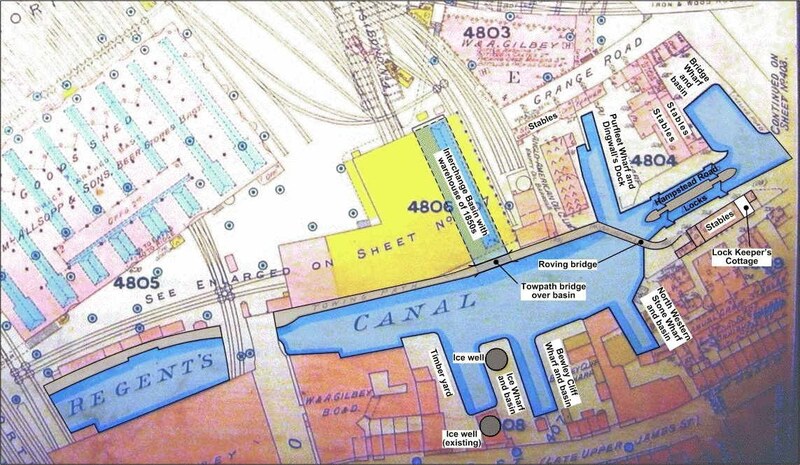 In December 1840 the L&BR acquired from John Semple and Thomas Hubert their leasehold interest in two wharves and two small basins on the north bank of the canal. The towpath, which initially ran behind the dock along what is now Camden Lock Place, was realigned. The new works, completed in 1846, included a towpath alongside the canal and two distinctive bridges. One carried the towpath across the mouth of the railway dock, now popularly known as “Dead Dog Hole”. The second was the roving or diagonal bridge of cast iron. The stone and metal approaches to both bridges are dramatically scarred by the tow ropes of barges drawn by horses out of the lock, and under the roving bridge which takes the towpath back onto the northern side of the canal. The arrival of the railway connecting London to the industrial centres of the Midlands and the north-west, and later London Docks, stimulated rapid development of goods transport and industry in Camden. However, the canal’s high value trade was increasingly lost, most notably when Pickfords, the principal freight contractor, deserted canal freight in 1847. An example of goods handled at the wharves at Hampstead Road Lock is the ice trade. In the 19th century ice had to be collected from frozen lakes or canals and stored throughout the rest of the year. 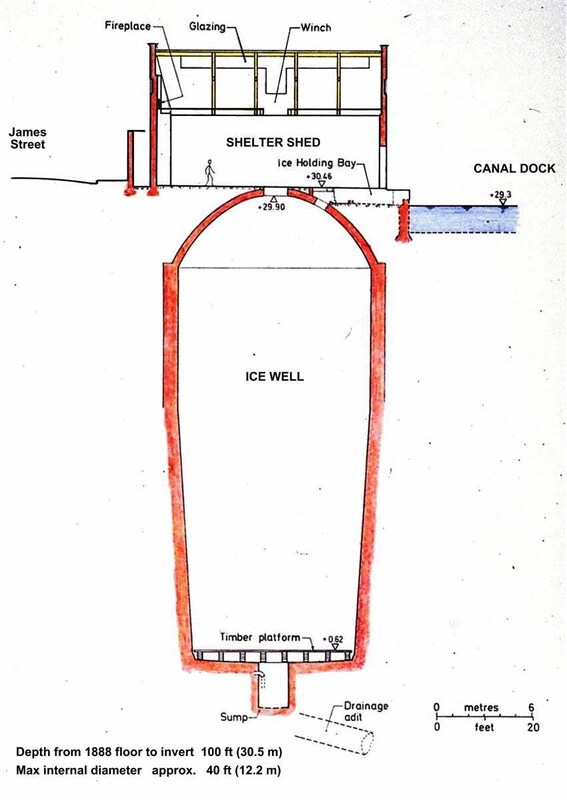 The source was not always clean, and in the 1820s William Leftwich started to import ice from Norway, bringing it by sea to Limehouse and along the Regent’s Canal to ice wells at Cumberland Basin and Camden Town. Two ice wells were dug in the 1830s at a wharf on Jamestown Road. The larger was built in 1839 and deepened in c1846 to 100 feet. It was capable of holding about 2400 tons of ice and was reported to be the largest in London. It is located in the entrance to 34-36 Jamestown Road (now renamed the Ice Works), where there is also an information panel providing the dimensions and history of the ice well.